Your Williamsburg / Historic Triangle Guide -- Find Williamsburg Hotels, Attractions & Events! Guide to Williamsburg is your complete resource for lodging, dining, attractions, even business and convention planning in the Williamsburg, VA region. The lovely cities of Williamsburg, Jamestown and Yorktown make up the Historic Triangle of Virginia, a delightful blend of past, present and future where a strong Colonial character is part of its history, culture, recreational and business outlook. Visit us every season of the year! Autumn provides crisp temperatures and gorgeous scenes filled with colorful leaves. Take a leisurely drive down the Colonial Parkway or enjoy one of the many fall festivals! Christmas is a favorite among time here in Williamsburg. Traditional decorations and fare make it a pleasant place to visit during the holidays. Bring the whole family! Locals and visitors to Williamsburg can find the best Williamsburg hotels, bed & breakfast inns and resorts, along with ideas for shopping and restaurants. 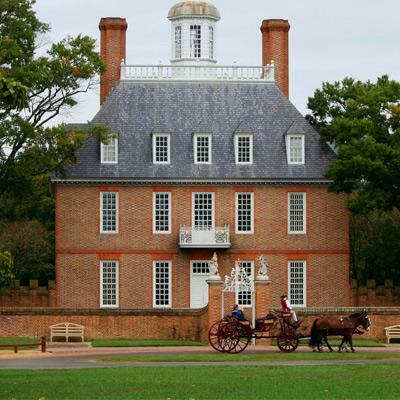 Bring the family and tour historic Colonial Williamsburg and other great area attractions. At the Guide to Williamsburg, you'll find information and links to everything you need to make your trip to the Historic Triangle a success. There are a plethora of things to do in Williamsburg, VA. Check our events calendar! Planning a vacation to Williamsburg? Check the weather before you pack! Moving to Williamsburg? Whether you're coming from across the country or just across town, you can find Williamsburg real estate agencies, even movers and self-storage companies. Browse helpful information on Williamsburg neighborhoods and find builders and contractors for new construction. Williamsburg VA is known for its exceptional business and corporate meeting facilities, where hospitality and technology combine flawlessly to create the perfect setting for your business meeting, convention, or trade show. With so many great hotels, restaurants, recreation and cultural activities, area event planners can help you locate and reserve the right meeting facilities to suit your needs. Spring brings with it gardens, pleasant temps, Farmer's Market and Busch Gardens! See why we ranked first in their 10 Great Places To Discover in the US! New at GuidetoWilliamsburg.com - Bloggers! These local bloggers will give you insight and information about Williamsburg, Virginia! Best Rides At Busch Gardens! See The Best Of Williamsburg! Locals tell their favorite places and things to do in Williamsburg. Offer a helping hand this season by volunteering your time for the greater good. Busch Gardens - World's 7th Best Theme Park! The Travel Channel ranked Williamsburg's Busch Gardens #7 among the world's best theme parks! As a small business owner, do you have concerns about the best legal structure for your company? Learn about some viable options available to you, advice courtesy of Williamsburg's SCORE leaders. Guide to Williamsburg needs YOU! Guide to Williamsburg offers residents and visitors alike an opportunity to explore what Williamsburg is all about, and get a real flavor for the area. Are you an expert in fine wines, or Williamsburg real estate? Know enough about local eateries to write a restaurant review? Maybe you’re one of those people who fell in love with vacationing here and finally decided to call it home! Whatever your specialty, e-mail us or call Lisa Bishop at (757) 565-5983 about how you can share your knowledge, stories, and memories, with our readers, and let your inner writer out! Guide to Williamsburg is Courtesy of Mannix Marketing, Inc., Specializing in Website and Logo Design, Search Engine Optimization and Destination Portals.